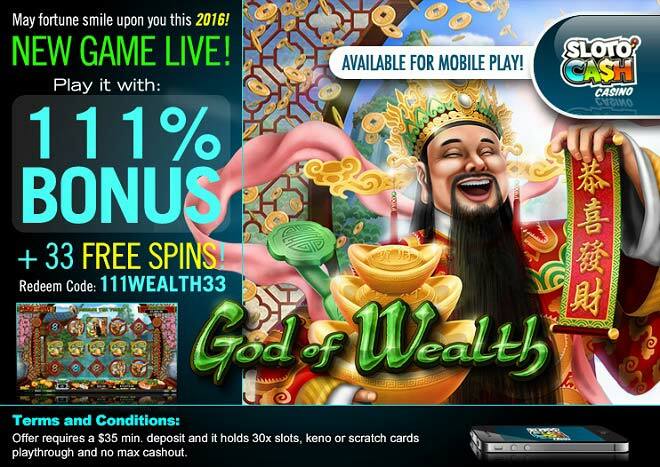 Kickoff the New Year on a secure path to prosperity as you hit the spin button of our brand new God Of Wealth slot! Wealth and riches are yours when you deposit as little as $35 to claim an extra 111% Match + 33 Free Spins! God of Wealth is an Asian themed video slot that has 25 paylines and 5 reels packed with all kinds of thriving winning opportunities. The Chinese god of prosperity himself works as a substitute symbol and appears on reel 3 during normal games. This symbol will substitute for all other symbols except for the scattered Gold Ingots. Moreover, winnings are doubled when the God of Wealth symbol substitutes in a winning reel combination. Trigger more riches by landing 3 or more scattered Gold Ingots anywhere on the reels and head to a second screen to reveal free spins. In addition, an extra Free Games feature will take place when God of Wealth appears on reel 3 during free games. Here’s to a wealthy start of 2016 when you deposit as little as $35 and collect a God of Wealth 111% Match + 33 Free Spins!